So, I decided to do a "riff" off of another recipe I was going to make this week. The recipe already looked good but I wanted to make changes and go with the sweet/salty combo. Here it is! This is definitely a budget friendly meal, which is why I made it this week. You can make this a side dish but I made it as our main dish tonight. Preheat oven to 400 degrees. 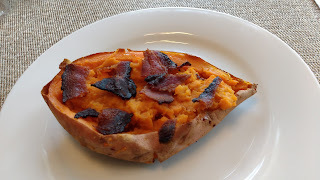 Pierce the sweet potatoes all over and place on a baking sheet with aluminum foil (I used a silpat mat) and bake for about 1 hour, until soft. *Depending on the size of your potatoes you may need to leave them in longer or shorter* Let cool for a few minutes. Cut the potatoes in half and spoon out the insides into a large bowl. 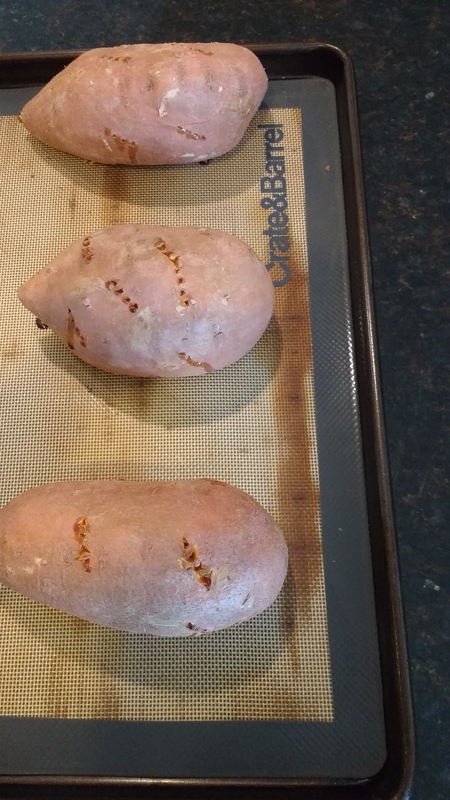 Leave some flesh inside the potato. Reduce oven temp to 375 degrees and brush with a little olive oil. Place the skins back in for 10-15 minutes. In the meantime, add the milk, honey, cinnamon and butter and combine. 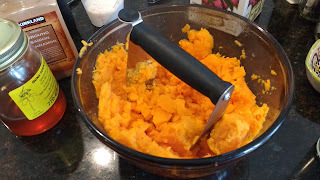 (I used a pastry cutter to "mash" the potatoes some) Take the skins out and fill with the sweet potato mixture. 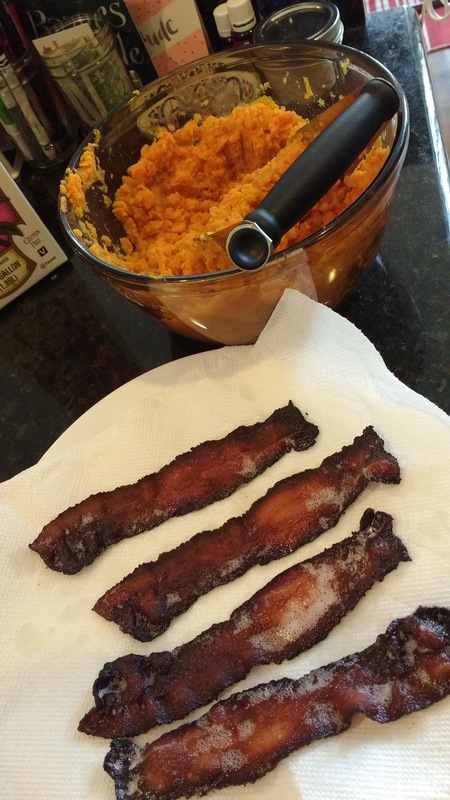 *At the same time, I put the bacon in to cook. I place mine on aluminum foil on a baking sheet and let them cook for about 15 minutes. * Place on a paper towel lined plate to drain the oil. 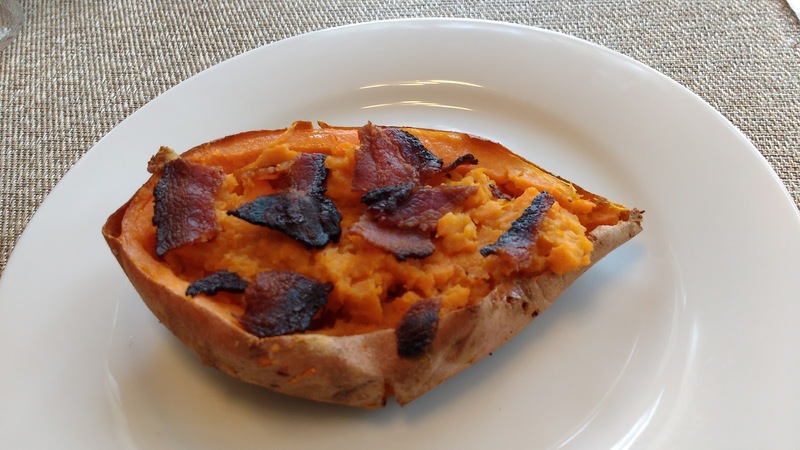 The sweet potatoes and the bacon will be done around the same time. P.S. 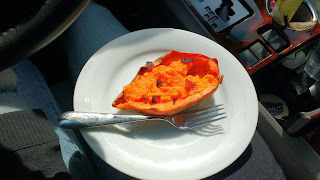 I actually ate mine in the car on the way to Costco- it was on my lap. Not our normal dinner but Ben took Luke to MMA and piano and I took Eve with me on a Costco run....real life. And I knew I would be hangry if I didn't eat before I got there AND I would overbuy probably, which at Costco is no bueno!!! It makes me smile that you brought nice silverware and an actual plate instead of plastic fork and paper plate/napkin to make it your meal on the go. Classy.